“The ad hoc process is greatly shrouded in mystery; remarkably little is written about it,” says current Senior Vice Provost for Faculty Diversity and Development Judith D. Singer. She smirks wryly as she swigs coffee from her mug, as if this is something she’s explained a hundred times before. Ten people carry 10 identical dossiers into Massachusetts Hall at 10 a.m. on select mornings throughout the academic year. The dossiers vary in size depending on the person under consideration for tenure—some are thick like a phone book, others are thinner. Each of the 10 dossiers opens to a special letter from the chair of the candidate’s department outlining the tenure recommendation. Each contains a full-scale report on the candidate’s academic history: published works, research summaries, peer reviews, course evaluations, a résumé. Each has been read in its entirety before the committee meeting begins. After a seven- to eight-year track, every tenure case at Harvard ends at an ad hoc committee meeting chaired by the President and Provost of the University. The meeting lasts around three hours. No notes are taken. No votes are taken. In addition to the President and Provost, the dean of the school, the divisional dean, and the Senior Vice Provost on Faculty Diversity and Development sit in ex officio. Five others join them: three area experts from co-divisional departments within the University and two from outside Harvard. Depending on the needs of the committee, Harvard will pay for experts from around the world to fly to Cambridge to participate in person. “What the ad hoc process does is it takes a recommendation that has come up out of a department, been through a dean, and says, ‘Let’s look at this with a fresh set of eyes. Let’s look at the totality of the evidence and make a dispassionate decision about whether the recommendations that have come up are really in the best interest of the University,’” says Singer. In addition to the dossiers and area experts, the committee brings in a set of witnesses from the candidate’s department, typically the department chair and the chair of the committee that did the promotion review, among others. As the witnesses arrive at half-hour intervals, they see the membership of the committee for the first time. Until that point, the identities of the panel—except, of course, those who are ex officio—are kept confidential to prevent advance solicitation. Following testimonies, the ad hoc committee deliberates: Is the candidate’s research up to par? What about the candidate’s teaching? Does the faculty balance necessitate someone of the candidate’s specific field? Is the candidate of the highest caliber to be tenured at Harvard? Can the University do better? The ad hoc is the mostly anonymous end to Harvard’s tenure process—when the dozens of classes and published papers boil down to a single decision. Many tenured and tenure-track professors say the process is unfair, that it is too subjective, too anonymous, and too unpredictable. But fairness may be beside the point. Those familiar with the process say Harvard is not interested in promoting good junior faculty, but rather in making sure it has the very best. Soon after lunch, the President adjourns the ad hoc session, generally without announcing a decision. Sometimes additional evidence needs to be gathered, additional experts need to be called upon. In easy cases, the President will make a decision before her next appointment that day. She alone has final say. Once decided, the dean informs the candidate of the outcome. The candidate, in turn, receives no report or explanation, simply the decision itself: a yes or a no. Members of Harvard’s Faculty of Arts and Sciences, junior and senior, gather once a month for a formal meeting in University Hall. They weigh proposals, hear updates on committees, voice concerns, and at a few meetings throughout the school year, they take time to recognize the newest members of their ranks. It is the only real moment of public recognition in an otherwise private process. As University President Drew G. Faust calls out their names, the newly senior professors make their way one at a time to the front of the portrait-lined faculty room. Most smile. Some cry. Those who do not already have Harvard degrees are awarded honorary ones, and faculty applaud. Tenure at Harvard is very difficult to get, particularly promotion from within. From job offer to tenure offer, scholarship and teaching are intensely scrutinized. For young scholars hired into the tenure track and brought up from within, evaluation occurs in Harvard’s classrooms and among its academic circles. Of the 20 or 30 assistant professors who are hired into that track across the University each year, many will not make it through a full seven years to tenure review. At the same time as junior faculty are moving up within the University, more senior scholars will be recruited from the outside. Though reputations and their own tenure positions have been earned elsewhere, ultimately these “stars from afar,” as Singer calls them, will compete with those closer to home for the same small number of positions. For those within the tenure track, the official weeding out process begins in the fourth or fifth year, when assistant professors are put up for promotions to the associate professor level. Throughout the process, junior faculty are reviewed and advised to leave if their work is not up to department standards; others quietly get the message that their chances of promotion are slim. The ranks will grow narrower still in the next two years leading up to tenure review. In total, of those who make it to final tenure review in the seventh year, roughly two thirds will be granted tenure, a figure far greater than at any point in recent history. Of the 43 tenured appointments Harvard made during the 2011-2012 school year, the last for which there is complete data, 73 percent were internal hires. Whether from within or without, Singer says, tenure should be difficult because the payoff is potentially huge: access to an elite intellectual community and the guarantee, barring academic or legal misconduct, of lifetime employment without fear of being fired. No single factor is enough to earn tenure at Harvard, those involved in the tenure process say. Prize-winning work may not be enough. Excellent teaching almost certainly is not. The quality and quantity of research is probably most important, they say, but even superstars are sometimes rejected. Past record must demonstrate future promise. If tenure is a financial and intellectual wager by the University, a scholar must prove himself a pretty safe bet. “To get a job at Harvard University, a tenure job, is to get one of, if not the toughest, most competitive jobs in the Anglo-American world, or in the world full stop. So it should be really, really tough,” says English department chair W. James Simpson. Even those who argue that the process can be inhumane and, in some cases, even lead to wrong outcomes, tend to agree that the process most often works as it should. Obtaining tenure at Harvard should be difficult; it is a question of whether the process is straightforward, or even works in the best interest of the University. If today’s tenure process lacks transparency, for much of Harvard’s history it has been opaque. Before 2003, Harvard did not have a defined tenure track. Assistant professors were hired with no promise of tenure review, much less promotion, and most often did not receive either. In some departments, decades passed between internal promotions. That is how it was when Singer arrived in 1984. Most tenured positions were filled by academics who had already made it big elsewhere and could be lured away by Harvard’s reputation. Often those same professors had been denied tenure at Harvard years before, only to be called up one day, without notice, and told that the President had approved their appointment. At the time, the logic made some sense. According to physics professor Cumrun Vafa, when he arrived at Harvard in 1985 as a Junior Fellow, the standard was that if Harvard made an offer to an outside professor, he came. By the late-1990s, Singer says the market began to change. Professors who had spent their careers somewhere else, whether it be the University of Chicago or Yale, became harder to convince to leave, and talented young assistants began to take real tenure-track positions at places like Stanford, where they often never left. “Where that might have worked in the past, what we’re hearing now especially from younger generations of scholars is that they want a community and they want colleagueship, and if they’ve spent time on a tenure track somewhere moving up in the ranks, I think they're going to be a lot tougher to pick off just because Harvard comes knocking,” says Cathy A. Trower, an education researcher at the Graduate School of Education. Reacting to that shift, former University President Lawrence R. Summers began to lay the groundwork for a tenure track at Harvard in the early 2000s. By the time it was instituted in 2003, Harvard and Yale were the only schools among their institutions without a tenure track. “From the point of view for the University, it’s a much better system, because we’re now moving from a system where disproportionately the people we were tenuring were from outside, now roughly two thirds of the people we tenure in any given year are our own junior faculty,” Singer says. By shifting to a tenure track, the University also shifted its expectations. Instead of hiring a lot of junior faculty and tenuring very few, it started hiring fewer, but trying to ensure that junior faculty were of a high enough academic caliber to earn tenure. The move essentially put Harvard back into the marketplace, so that it now competes against peer institutions for the top young talent, instead of waiting to recruit it later. Since 2003, when the tenure track was put into place, the number of assistant professors across the University has fallen by a third, from 335 in the 2003-2004 school year to 224 this year. In FAS, that number has dropped by roughly half from 121 a decade ago to 66 today. At the same time, the numbers of associate and tenured professors have climbed to all-time highs as more from within move up the ladder. In 2003-2004 there were 199 associates and 907 tenured professors, compared to 240 and 1084, respectively, today. But that shift, from tenure offer to tenure track, is not without critics. Senior professors who have been here since before the system was put in place say that the University may have overcorrected when it comes to junior faculty. The promise of internal promotion, they warn, may be hurting Harvard’s commitment to offering tenure to only the very best in a given field. At the very least, internal promotion need not be given priority over external recruits, they say. Simpson, who saw the English department through the transition and praises the tenure track, still says the internal appointments are not enough to maintain Harvard’s academic standing. The path toward tenure begins the first day an assistant professor is hired, and usually lasts eight years for those who stick around long enough to complete their appointment. Those on the track form a fairly selective group. Of 624 current ladder appointments in FAS, the University’s flagship faculty, only 144 are tenure-track and just 66 are assistant professors, the lowest rung on the tenure ladder. Assistants are hired depending on the needs of individual departments. All offers must be approved by the Dean of FAS, and vary depending on the academic marketplace and broader economic factors. In the humanities, most new assistants are hired from Ph.D. programs. In the sciences, most will have had a post-doctoral fellowship in a lab at Harvard or a peer institution. For the most part, junior faculty will teach courses, go on leave, and publish writing and research just as their senior colleagues would do. According to Singer, the University tries to protect junior faculty from committee work and other University service usually taken up by senior faculty. That way, junior faculty can focus on building their academic reputation, which is the most important factor in promotion. “I did get tenure, though it was very clear in my seven or eight years up to tenure that one had to publish a great deal, publish it in prominent places, become very prominent in one’s field through publication and other forms of activity as well as through teaching load and other various forms of service. I think that’s a familiar story,” Armitage says. Though he was tenured at Columbia before being recruited by Harvard in 2004, he says the process there is much the same. According to recently tenured history professor Alison Frank Johnson, in the humanities this means publishing a “big second book.” In the research sciences, it means innovative lab work as well as securing the external funding to make that work possible, Cox says. Though the specifics are very different, for David Rodowick, director of the Carpenter Center and department head of Visual and Environmental Studies, it means evaluating the venue and reception of artistic work. “It’s difficult to understand that the process of getting tenure at a place like Harvard is not the sort of thing where you check all the boxes,” says Statistics department chair David P. Harrington. The quality of that research and of a junior faculty member’s teaching is evaluated throughout the process. Senior faculty mentors formally and informally advise junior colleagues on their early courses and help facilitate research and publishing opportunities. In their second and fourth years, junior faculty go through a series of reviews meant to give them a sense of how far they have climbed up the tenure ladder. The former is meant only to be an informal corrective, while the ladder brings the opportunity for promotion to the associate level. Here, the tenure-track splits. With the advice of the department chair and a letter from the FAS-wide Committee on Appointments and Promotions, some will continue up the ladder and others will begin the job search elsewhere. Unlike other universities, which grant tenure at the associate level, Harvard is one of two institutions that only confer tenure on full professors. 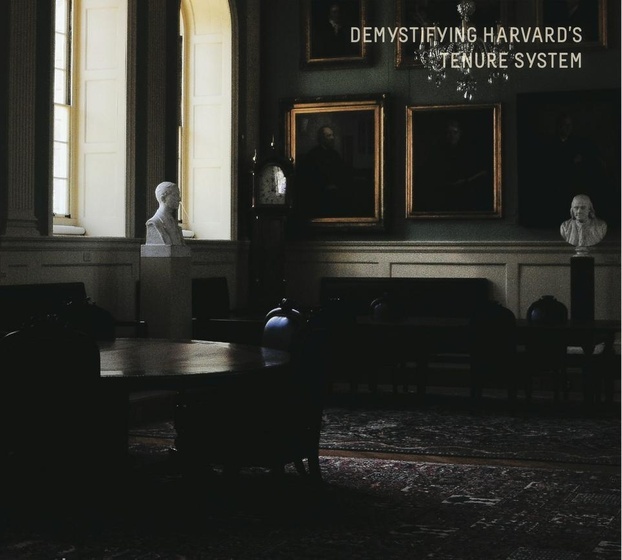 Though it leaves associates vulnerable to being lured away by other institutions, Singer says that by not tenuring at the associate level Harvard is able to maintain otherwise higher tenure standards. However, many senior faculty members find this explanation insufficient and worry that Harvard is losing talented faculty to the lateral recruiting of peer institutions. “I don’t really see why we make this a rank problem because it is just anomalous,” says Menand. Associate professors at Harvard are usually put up for final tenure review in the seventh year. For those who have had a child during the process, another year is automatically added, but their work is essentially done by the time review comes around. The same steps that were taken during the fourth year review are taken again. Still, many involved in that process say that lack of transparency poses problems. It is one thing to say, as the FAS Handbook does, that Harvard will tenure scholars “of the first order of eminence,” but defining what that means is much harder, at least for those going through the process. Trower, who studies the tenure process at various institutions around the country, says that on a transparency spectrum, Harvard is pretty much at the bottom. While Trower and other professors who have gone through Harvard’s tenure track say that the anonymity and confidentiality of the ad hoc process is important to maintain, Harvard could do a better job of laying out expectations for junior faculty. “If we know what it takes to achieve tenure, and we know what kind of people we’d like to tenure, we ought to be able to tell people what those criteria are, because otherwise how are you making the decision?” Tower asks. Menand keeps his office door open. He has no qualms loudly upbraiding administrative opinion because his job at Harvard has always been secure. He received tenure from the City University of New York in 1988 after being denied a permanent position at Princeton in 1987. “By the time I got tenure, I was kind of like, it is about time,” he says. In 2003, Harvard hired him externally to the post he is in now. Menand is a staff writer for the New Yorker, was a regular contributor to the New York Review of Books, and the recipient of the 2002 Pulitzer Prize for History. “I was hired because of my writing. The University wanted information about my teaching, which I provided, but I was on their radar because of what I had published,” he says. Despite the widespread view that teaching ability is entirely ignored by ad hocs, the tenure review process has, in fact, increasingly attempted to recognize teaching over the past several years. In actuality, Menand says, the split is still severely skewed, “It’s true that, at the margins, a person that is an unsuccessful teacher or irresponsible, or a person that is an especially charismatic and successful teacher, that it can make some positive or negative difference in the case, but absent publication, nothing else really matters.” Of course, teaching and research are not mutually exclusive; good research often begets good teaching. “Tenure decisions in which research plays a large role is one way for the University to ensure that the people who are in the classroom are current and not teaching something that became stale 10 years ago,” says Harrington. Still, by not raising the stakes for teaching performance, the temptation to scrimp on classroom work is almost irresistible. There were occasions when professors would make their grad students write syllabi for their courses or turn out translations for no pay, recalls Selena, a former Harvard College Fellow in the Humanities, who left Harvard for a tenure track position at Wesleyan. Selena was granted anonymity by The Crimson because she did not want her identity to reveal the name of her former department, and thus damage the reputation of her former colleagues. “There’s no accountability in the process,” she says. One major limit when it comes to including teaching performance among ad hoc considerations is the feasibility of teaching evaluation. A tenure dossier is well equipped to render opinions on research ability. Book reviews, citations, and the amount of work generated by one’s ideas yield a great deal of reliable evidence. What’s lacking, however, is a reasonably objective yardstick for testing performance as a teacher. An annual course evaluation guide published by the Committee on Undergraduate Education—known as the CUE or “Q” guide—provides some measurement of teaching ability. Johnson considers the CUE Guide to be the “only systematic way of evaluating teaching at Harvard,” though, she says, “it is a terrible way of evaluating somebody’s teaching.” Although some students take the evaluations seriously and write helpful comments, Johnson says such instances are few and far between. Ideally, research and teaching go hand-in-hand—the great professor contributes to the scope of knowledge while at the same time dispensing it. But without a means to measure—and reward— teaching, students are often left with senior professors who conduct their classes with unconcealed distaste, rehashing old overheads compiled a generation ago, stifling the bothersome questions at office hours, and begrudging every minute stolen from the lab. There are, of course, the occasional geniuses whose level of research covers all defects and makes them essential hires even if their lectures are grunted and monotone. But geniuses are rare even among Harvard’s professoriat. The lay-professors ought to be skilled at teaching and research, but the Harvard’s current tenuring process hardly allows it. “I’m told often that teaching really matters but I don’t see a lot of evidence that being an exceptional teacher will result in a real reward here,” says Cox. “My sense as an untenured person was that if you’re a great teacher but your research isn't up to snuff, it’s not going to help you,” says Selena. She explains that the predominant attitude among junior faculty is not to take teaching too seriously as something to help them get tenure. It’s an attitude that discourages naturally good teachers from putting in the time in the classroom. Rodowick, the VES department head, has noticed the opposite. He says the introduction of a tenure track system has actually helped to redress the understatement of teaching. “In the absence of a ladder rank system, you put younger faculty in a situation of insecurity in which they will be very risk averse, or they are too careful about their teaching and don’t want to leave their comfort zone and don’t want to be innovative,” he says. Though the tenure track might offer the freedom for junior faculty to innovate in the classroom, there’s little evidence that it actually pays-off in the ad hoc. Associate English Professor Matthew Kaiser is arguably among the most innovative instructors at Harvard. In Fall 2011, his course “Literature and Sexuality” had the fourth highest enrollment, right behind Ec 10, CS50, and LS1a. The course was an elective and neither a prerequisite nor an officially listed Gen Ed. But students flocked to the course because of its lewd subject matter and Kaiser’s nonpareil teaching marks in the CUE guide. Yet last year, Kaiser was denied tenure. One can only assume the ad hoc found his level of research inadequate. Harvard has attempted to rectify its teaching problem over the past decade by increasing the number of core non-ladder faculty in its ranks. These are the senior lecturers, preceptors, and professors of the practice whose primary role at the University is to contribute to its teaching mission. They are neither tenured, nor tenure track. According to the 2010-11 Harvard University Fact Book, core non-ladder make up over one-third of FAS—a number that has been steadily increasing. The core non-ladder includes many of the more prolific instructors among undergraduates: David J. Malan ’99 whose computer science course CS50 has seen enrollment triple since he took over in 2007; Robert A. Lue who helped found and still teaches LS1a; Michael I. Parzen who teaches the current most-enrolled course Stat 104; Timothy P. McCarthy ’93 whose name is eponymous with the History and Literature department and Carr Center for Human Rights Policy; Jeffrey A. Miron who leads the second largest course in the Economics department. Though the rise in the number of core non-ladder over the past few years can be attributed largely to the University’s attempt to enhance its teaching reputation, it is well-known that non-ladder also offer a pragmatic solution to dealing with the limited resources of the University in the economic downturn. Even the senior-most non-ladder faculty members are paid substantially less than tenured professors. They are cheaper, expendable, and, of course, fireable. The best are rehired indefinitely. With many of the lesser known non-ladders, however, the issue of job permanency strikes deep. Most come in on a rotating basis of fewer than five years. “When you talk to non-ladder faculty, many of them say they would really like some kind of position that was more secure, more longer term,” says Singer. Like Selena, when many non-ladder faculty members leave Harvard they go to liberal arts colleges where the tenure track is less research-arduous and more considerate of teaching ability. Where teaching benefits from tenure is in the fact that professors are better able to maintain academic relationships with their students. While big name lecturers certainly pay their dues to pedagogy, the rest—so long as their position at Harvard is transient—are a makeshift solution to a tenure system in which teaching is not the first priority. When a beloved junior faculty member is denied tenure, we often lunge for the throat: How can the administration “fire” such a good teacher? It’s easy to accuse the tenure process of failing because, indeed, it is far from perfect. Harvard loses good professors all the time. Given such limits and what some characterize as Harvard’s proclivity to lag in modernization, Harvard’s ad hoc process remains among the most thorough and fair tenure systems in higher education. “[The ad hoc process] is a massive investment of intellectual capital in the future of the junior faculty. I take great reassurance in the care and massive amounts of great work that goes into putting together the materials and putting the committees together,” says Armitage. There are certainly ways to tighten the process, to give greater weight and measure to teaching, for instance, but as it is in all other industries, investing in human capital is a volatile operation. A brilliant young scholar might turn slothful and negligent once given tenure. He might become what Larry Summers once called “an extinct volcano.” A junior faculty member might be denied tenure only to be recruited back a few years later—Theda R. Skocpol, professor of sociology, “is probably the most famous example of that,” says Singer. For the last five minutes of the interview, Singer perfunctorily glances at her watch. She wants to make her point, so she gestures to three ream-sized file-folders piled on her desk nearby. One of the dossiers behind her is for an ad hoc meeting scheduled for that afternoon. An earlier version of this article incorrectly stated that assistant professor David D. Cox ’00 is a member of the Biology Department. In fact, Cox is an assistant professor of computer science and of molecular and cellular biology. An earlier version of this article stated that the fall 2011 offering of “Literature and Sexuality” was not a Gen Ed. To clarify, while the course was not officially listed as a Gen Ed, it did count for Gen Ed credit.